You don't need any SEO optimization company to know about image optimization techniques. The Google algorithm keeps changing for images too, and ProBlogBooster is trying to update you with new tech tips. This page is all about to know the google images ranking factors that will help you to get your images listed in SERP. It's one of the best SEO tips and tricks that drive image traffic to your site. 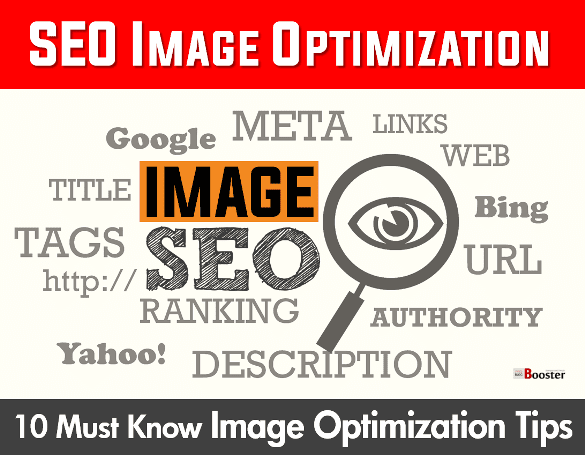 Online publishers used to search; what is image optimization? How do I improve Google image search? How do I get the image to show up on Google search? Does Google use title tags? How to optimize images for WordPress? How to optimize images for blogger? How to optimize images for SEO? How to write SEO-friendly alt-text for your images? The 'Image Optimization' is an art as there is no definitive answer for how best to compress the picture. Image optimization is a science as several techniques and algorithms help, not only in reducing the size of an image significantly but also assist you to get your images indexed asap in search engine by means of best SEO report. Innovative development serves optimal settings for a picture to have many dimensions like the format, pixel dimensions, quality, the content of encoded data, tagging images for SEO, etc. An image optimization and On-Page SEO are two basic steps in SEO optimization and are recommended by most of the best search engine optimization companies. The On-page optimization is the pillar of SEO whereas image optimization serves the most important factor in building the firm support. Rather, Image optimization is one of the building blocks of an organic search engine optimization. The pictorial information is more attention seeker, provides more data than text and that is why most of the SEO marketing companies are now focusing on image optimization. Maybe because of this the sites like Pinterest are growing popular these days. I have listed most important image optimization tips so you don't need any google image optimizer tool to drive organic search traffic to your blog. Most of the premium SEO services are using these image alt tags seo best practices to grow their traffic from image search engine. I would like to say, don't be dependent on any search engine optimization agencies and try your own SEO strategy plan to build website traffic and that is called as a search engine ranking optimization. Especially for eCommerce, I would like to say, optimize all of your product images to maximize organic traffic and so the sales. Here's I have listed quick tips for SEO image optimization that you need to consider to optimize your images that'll help your web page rank on search results. Implement these image SEO techniques and improve your organic search engine rankings. What is TITLE text on an image? - The image title text or title tags is a source of information about the image required for search engines to crawl. Especially Google gives relatively high value to the title text information. The title tags describe what is derived from the image and the purpose of that image on the page. It also determines what is shown in the picture and the topic of the surrounding text. So it is necessary for every image to have a title text or title tags to get indexed and to drive organic image traffic. What is ALT text on an image? - The Alt Tags is an alternate source of information. Alt tags are always associated with an image. These tags operate to describe the image once they are implemented properly and carefully. Alt tags provide valuable information to the users those cannot be able to download or see the images on a web page due to low-bandwidth, visual impairment or the use of screen readers. Images are more difficult as compared to text for search engines to understand. As the search engines crawl the web content, the alt tags help them to know the image data & related information in the article. The quality images with the title tags & alt tags increase the chance of search engines delivering your images in search requests. It also helps to treat your content best by search engines if the images are linked. A good blogger never ignores the importance of the images. He also understands the importance of traffic to the blog from every field. Images speak more than words. And it is vital to optimize the post with quality images. 1. Select the perfect image for your article. Free royalty free photos for commercial use - You must know, finding and using the relevant and right images for your blog website is an important part of SEO. You can able to get a broad range of various royalty free stock photos to choose from varieties of online sources or free images for commercial use. Images speak more than words. And thus it is necessary to add images relevant to the content topic. 2. Title tags and alt tags optimization for better SEO. Tagging images for SEO - The image title and alt tags are important as they tell the robots about your image description. The robots crawl the image on the basis of alt description SEO derived by title & alt tag. With the title tag optimization, the alt tags are the text alternative to the image, that robots can detect quickly and so Google optimize images easily. Appropriate alt tags to the pictures help the website getting better ranking in the search engines. I highly recommend you to check alt tags before you publishing your next blog post. 3. Always include targeted keywords in your title + alt Tags. Target SEO - When it comes to image optimization in your Alt Tags, it is important to use acceptable and targeted keywords with on-page keyword usage. Such relevant keywords help the web page rank top on the search engines. 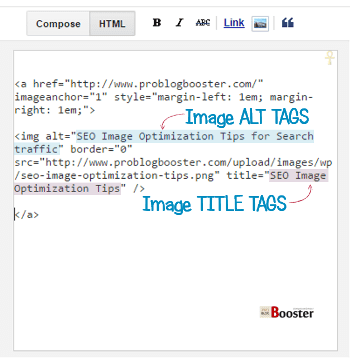 It is important to create descriptive, keyword-rich alt tag for image optimization. This is the best technique of seo and keyword optimization for seeking attention from search engines. These targeted keywords help you for particular keyword search marketing and so increase domain authority in your blogging niche. 4. Avoid special symbols in images description tags. Ignore special keyboard symbols - It is recommended to strictly avoid special characters or registered trademark alt code in describing the alt tags or title texts of the images. Never use samples and special characters like ‘#, $, @, ^, &, !, ?, *’, etc. in image alt tag. This is because visitors never search image they want to start with these cool signs or alt special characters. 5. Using hyphens instead of underscores. Hyphen or Dash - The hyphens are always better than the underscore in Search Engine Optimization. And that is why it is recommended use hyphen ‘-‘ instead of underscore ‘_’ sign in image title and alt tag. 6. Put Your Image ALT+TITLE Tags to Work in WordPress. 7. Choose the right image file format for your needs. Best photo format for web - After selecting the relevant image, you need to decide the file format. The JPEG, GIF, and PNG formats are most commonly used today for image optimization. Using JPEG format, you can keep the file size small and is supported almost everywhere. GIF, the bitmap image format serve animation and support 256 colors is ideal for transparent backgrounds, company logos, etc. PNG is the most modern format that supports transparency, store short text description and has a better color range. You can find png images online for free. 8. Image SEO - file name. Naming the image file - It is very important to give descriptive, easy and understandable names to your image file. Easy file names make it easier for search engines to find them. For example, "SEO-Image-Optimization-Tips" or "SEO optimization company" etc. 9. Image hosting & management is very important. Web hosting images - Most discussed question is; where to host images for website? Serving images from a different domain may impact negatively on SEO. It is very important to choose a proper and suitable image hosting service. WordPress is the most suitable and proper image hosting platform. Well, Flickr is also the best platform to host images. There are plenty of free photography website hosting and public image hosting servers available, but I recommend you to check the performance and the speed before using them. Top 12 Best Plagiarism Checker Tools To Detect Copied Contents that allow you to check duplicate content for free. SEO friendly images - It is always important to add image sitemaps to your Google webmaster tools. This helps faster and proper crawling of your images. WordPress plugin like WP image sitemaps is excellent to generate image sitemaps. 11. Write the SEO-friendly caption for images. Unique captions - It is necessary to add a caption to your image, either on top, bottom or side of the image. This will help the search engine to know what the image is about. The caption added to the image makes it little more descriptive about the picture. 12. Working with Image Thumbnails. SEO practices for thumbnails - Most of the eCommerce website use thumbnail pages. They provide a great platform to quickly scan the category pages without taking up a too much real estate. It is advisable to make thumbnail file sizes as small as possible. Moreover, you can go with the post thumbnail WordPress plugin for handling the thumbnails. Thumbnails are always great but need top-notch care while using them. 13. Beware of decorative images & its file size. Standard high-resolution image size - While using high-quality web pics you need to keep an eye on its file size. Websites with decorative images can add a lot of aesthetic appeal to your web page, but checking the file size of the decorative image is worth. You can use the template that can minimize the file size. You can create good-looking images with few hundred bytes big. Shrink the larger wallpaper-style images as much as possible without bargaining with the quality of the image. 14. Test your number of images & performance per page. Images for performance - Before you upload all of your selected images, it is important to check & test the same. It is also necessary to check the number of images on the website you are going to upload per page. While publishing web graphics always test how many images you should have on the pages and have a speed test for that particular page. You need to work on the images for performance and compress it by online best photo compressor tools. 15. Integrate social media for better branding. Social media and email marketing - Social media plays a vital role in overall search engine optimization. The easiest way to integrate your images into social media platforms is to add a share button to your website. Call your audience for action to spread and share your pages on social networking site. This will help you to improve page authority. From my experience, I can tell you the images generate a ton of quality traffic, and that is why they are the most affecting factor for SEO optimization of the page. The optimized images boost SEO and take your pages on top of all search results. Now you have realized that optimizing the images for search engine traffic is very easy. If you want more traffic to your blog web page, it is important to add an SEO optimized images to your each blog post. Image optimization can be an important part of building a successful eCommerce website. So, prepare yourself to optimize the image for search engine traffic and experience the great difference in the size of traffic. Let me know what you think all about this. If you want to add some or want to point out, then don't forget to leave your feedback on the comment section shown below.